The Hunter Round is a field archery tournament of 28 2D paper targets firing 4 arrows per target from RED colored stakes. 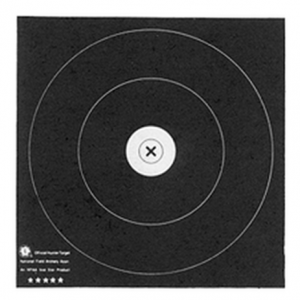 There are 3 scoring zones on each target. Each arrow scores either 3 points for the outer black ring, 4 for the middle black ring or 5 for the center white ring. There is a center X ring to the inner 5 point zone. 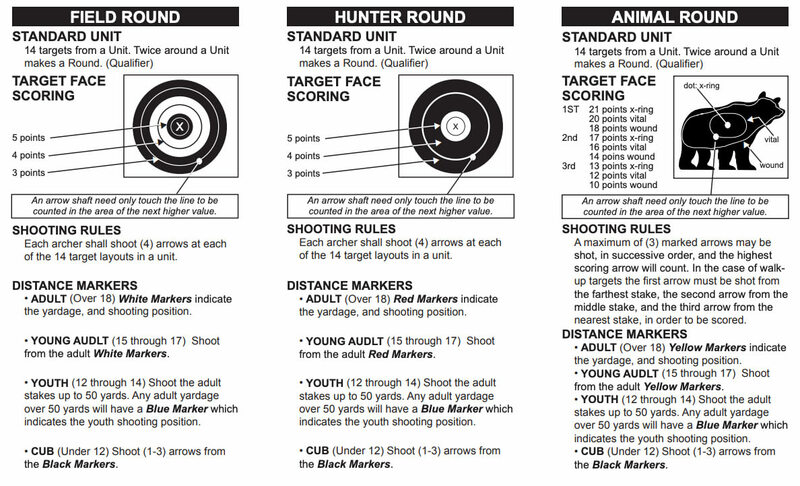 Add up each arrow’s score to give a total score out of a maximum 560. Yardages are marked and are in ‘uneven’ increments (not always in multiples of 5 yards) from the target from 33 feet up to 70 yards. 1) All four arrows shot from one marked stake. 2) “Fan”: Each arrow shot from a different marked stake spread in a fan pattern, with each stake at the same distance to the target. 3) “Walk Up”: Each arrow shot from a different marked stake at decreasing distances to the target. For example, one arrow each at 45, 40, 35, 30 yards, or two arrows each at 45 and 40 yards. Posted on February 13, 2019 by archer1.